Evelyn was a graduate of Villa Maria Academy, and attended Villa College. For 35 years, she was the owner of Evelyn's Hallmark in the K-Mart Plaza, Harborcreek, PA. Owning the store was more than a job, it was a calling, allowing her to help people celebrate milestones and make an impact on countless lives. She enjoyed trips around the world and was blessed to experience the beauty of God's earth with the best traveling companion ever, her husband Dave. The famous “10-year-old-trips” with each grandchild held a special place in her heart, as it did theirs. 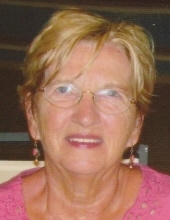 She was active in many ministries, a long-time member of St. Mark the Evangelist Catholic Church in Lawrence Park, and more recently, was an active member of Our Lady of Mercy Catholic Church in Harborcreek. The projects she took on were extensive and varied, from rallying friends to donate hundreds of boxes of Christmas cookies to the homeless to gathering birthday supplies for children who wouldn't celebrate otherwise. Evelyn was a current board member of Catholic Charities of the Erie Diocese, a dedicated, long-term, weekly volunteer with Emmaus Soup Kitchen, and especially enjoyed her role volunteering with the Connecting Hands organization. Evelyn is survived by her dear, beloved husband of 53 years, David A. Seyboldt of Erie, and four children who were blessed beyond measure to have had this wonderful woman as their mother, Diane (Jim) Gotch of Kirtland, OH, Debbie (Rick) Kline of Calcutta, OH, Janet (Charles) Peters of Erie, PA, and David (Heidi) Seyboldt of Denver, CO.
Left to cherish her loving memory are Dave and Evelyn's nine beloved grandchildren, Jacqueline and Jimmy Gotch, Kristina, Nathan and Mark Kline, Charlie, Katherine and Lily Peters, and Gabriel Seyboldt. She is also survived by a sister, Shirley Markley, of Erie; a brother, Ken Schmitt of Erie; and several nieces and nephews. The number of lives she touched with her love, devotion, and compassion cannot be put into words. Friends may call at the Dusckas-Taylor Funeral Home & Cremation Services, Inc., 5151 Buffalo Road (at Hannon Rd. in Harborcreek Twp. ), on Thursday from 7 to 9 pm and again on Friday from 3 to 7 pm and are invited to attend a Prayer Service there on Saturday at 9:15 am followed by a Funeral Mass at 10 am at Our Lady of Mercy RC Church. Interment will follow at St. Gregory’s Cemetery. In lieu of flowers, donations in Evelyn's memory may be made to Catholic Charities of the Erie Diocese or Emmaus Soup Kitchen. To send flowers or a remembrance gift to the family of Evelyn Mary Seyboldt, please visit our Tribute Store. The Funeral Mass will be celebrated by the Rev. Msgr. Gerald T. Ritchie, Pastor of Our Lady of Mercy Roman Catholic Church. A prayer service will be conducted at the funeral home on Saturday at 9:15 a.m.
"Email Address" would like to share the life celebration of Evelyn Mary Seyboldt. Click on the "link" to go to share a favorite memory or leave a condolence message for the family.